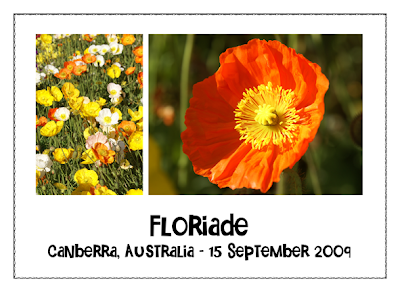 Earlier this week I took the kids to Floriade. It was a simply glorious day, and we had a lovely time. We smelt and admired the beautiful flowers, rode on the ferris wheel, browsed the market stalls and indulged in ice blocks. C'est la vie! I also made you a little postcard, so you could check out some of the beautiful floral action for yourselves...I love poppies! I have used a Storyboard Template and a Painted Border action, both by Rita of Coffeeshop Photography. The font is called 'Little Star', and is from scrapNfonts. I have run Pioneer Woman's 'Colorized' action, followed by her 'Boost' action...and I liked the end result. Gotta go now, Dan Brown is waiting for me. Yes I am supposed to be doing the washing, but you know what? It will still be there tomorrow...and by then there will be another two more loads to do too! Have a wonderful day :-). PS. My apologies for the lack of papercrafting going on around here...I just have not felt like stamping at all. Beautiful pictures Sam! 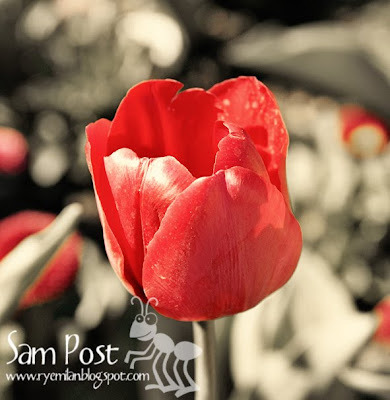 One day I would love to get to Floriade or even to the Carnival of Flowers in Toowoomba!! I have hardly done any stamping lately either - think it is good to have a break and do other things. Gorgeous pictures, love them, they look great as a story board. Love all the story boards Rita has been making lately. Must confess I've been on a bit of a rest from the paper crafting side of things as well but I don't think it hurts to stop and recharge the creative batteries once in a while. It doesn't hurt to take a break when you need one and in the mean time you've been taking some marvellous pics! Chin up & roll on your regionals to recharge YOU. Have never made it to Floriade but its on my list... When your page loaded it immediately made me smile because the colours of the poppies just leap from the page. They're my favourite flower, from their furry little buds to the wide and papery petals, and they only come in cheery colours. The remind me of my grandfather who used to plant great swathes of them in his gardens wherever he lived. Have just crept back into paper-crafting myself, still too many good books on the pile and now warm days to sit in the garden and read instead! !